← There is an app for that! But…? Mercy Instructional Technology — Leading the Way! So much changes so fast with educational technology. A year ago, we had not even decided to adopt the iPad. 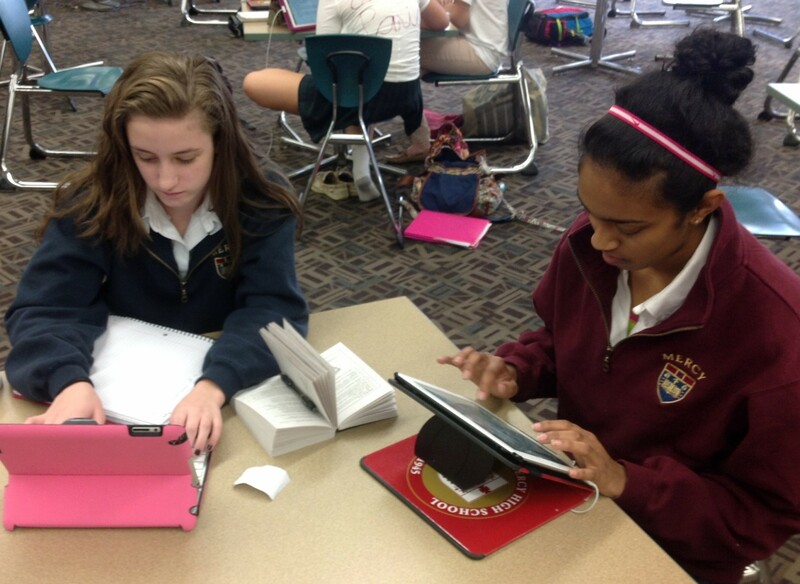 A year later, not only are 45% of our students (and all ninth graders) using them, Mercy High School is seen as being on the leading edge of educational practice. Each week I get calls from other Catholic schools in the Midwest about how we sell, network and deploy our iPads and their apps. However, two of us have just found our ideas about teaching with the iPads to be in great demand as well. Alison Kline-Kator and I have just been named as primary presenters at the 2013 MACUL Conference, Michigan’s leading conference on educational technology. When I attended the MACUL Conference last year, I took away all kinds of valuable information about the iPad. It will be pretty cool to be sharing our first hand experiences this time around. L. Baker, Associate Principal/Operations & Apple Distinguished Educator.